Jakie Forbes has been teaching Tellington TTouch in the Southeast for many years. She organized a wonderful training for me in Louisiana about 20 years ago. It is inspiring to see how her influence continues to spread. We have had some remarkable changes in race horses over the years, and I hope to post more about them here soon. Take a look at an article about Jakie Forbes’ use of TTouch in training horses for the track here. First, we want them to be aware of their own bodies. Like humans, young horses are awkward. We want to cultivate their sense of balance as well as an awareness of the power of their hindquarters. Without such training, they naturally place the bulk of their weight on their front feet, leaving them without the controlled sense of thrust and balance that they need in order to carry out any of the performances that we so admire in horses, whether it be dressage, jumping or racing. Although one person traditionally leads a horse, we often “double lead” when we are doing the training. 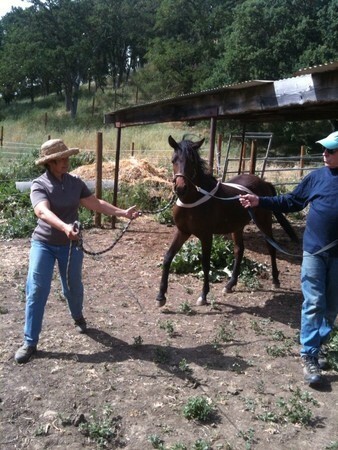 The horse seems to feel more secure with a person holding a lead attached to each side of the horse’s halter. The leaders are safe and work as a team to help the horse stay in balance when facing the unfamiliar. 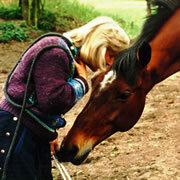 So many details and signals make interaction with horses more pleasurable and safe. At the same time, the horse is learning a great deal about its potential for communication and movement in harmony with humans. How do I discourage herd-bound behavior? I’m in Germany having just the best time working with amazing horses, and thanks to the folks at Eurodressage, I found this wonderful YouTube video demonstration of TTouch at work in the Playground for Higher Learning at Green Chimneys in Brewster, N.Y. I was there in April of 2009 for the Humane Education Conference, which was co-sponsored by Green Chimneys and the ASPCA.